That verse pretty much sums up my day yesterday. I thought we were going to have two children spending the day with us and we ended up with five. I also thought it would just be the three of us home for dinner and we ended with six for dinner. What is a woman to do? Stuffed turkey breast was the menu plan but one breast was not going to be enough for six people, so I decided to make sliders out of it. You get two recipes for the price of one today! Begin by butterflying the turkey breast. Use a meat mallet to pound the meat to an even consistency. Season both sides with salt and pepper. With the meat laying flat, add a generous amount of basil pesto and spread evenly over the surface. Next, add the feta cheese. Thankfully, these no knead yeast rolls only take about an hour to make! This is what I used for the buns. Once the meat has cooked, remove it from the oven and allow it to rest for about 10 minutes. This will allow the juices to absorb back into the meat and prevent it from pouring out all over your cutting board. It also helps prevent the meat from being too dry. Slice the turkey breast about 1/2 inch thick. Just look at all that lusciousness! 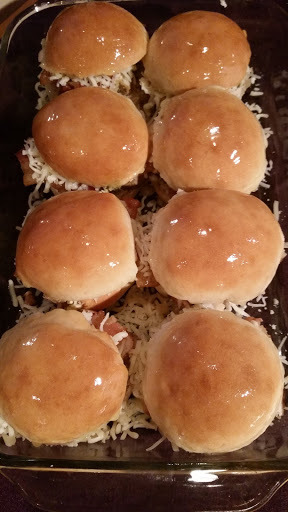 To make the sliders: Cut the rolls in half around the center. Place the bottom portions in a 9×13 pan. 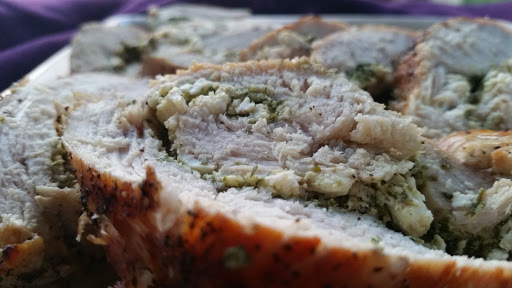 Add one slice of the stuffed turkey breast, one slice of cooked bacon, and a generous portion of mozzarella cheese. Place the tops onto the sliders and slather the tops with melted butter. Cover with aluminum foil and bake for another 10-15 minutes until the cheese is melted. 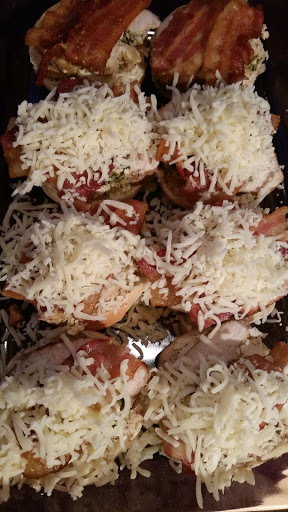 These turned out really well…after all, how can you go wrong with basil, bacon, and cheese!